The Ferrari TestaRossa: A New UK Record Breaker. A 1950s Ferrari has recently broken records to become the most expensive car ever sold in the United Kingdom. Despite being a prototype, this 1957 Ferrari TestaRossa has had a magnificent career, having won a number of famous race and even taking part in the famous 24 hour Le Mans Races twice. The Ferrari has been purchased by an anonymous buy for a reported £24,000,000 destroying the existing UK record of £22 and a half million, set by the sale of e Ferrari 250 GTO.The TestaRossa is not only one of the rarest cars made by Ferrari, but many in the industry believe it to be one of the best cars ever made. The TestaRossa sold is in great condition, with the original steering wheel, dials and lather still intact, while on the outside, it still retains the original paintwork and boasts a gorgeous set of wheels. The car was sold by millionaire investor Eric Heerema, although the price he paid for it in 2009 was only a third of what he has recently sold it on for. While no official price has been released for the Ferrari, insider sources hint that the new owner may have forked out over £24.1 million, making it the most ever paid for a car publically sold within the UK. This is not the first time TestaRossas have been sold in recent years, in 20122 two inferior TestaRossas were sold in the USA for £10 million a car. What sets this new Car apart from the two sold in the US is both its winning past and the condition in which it has been preserved. With no modifications and an obviously great amount of care taken to look after it, many of the parts of the car are in next to new condition. It didn’t take long for the TestaRossa to accumulate legendary status amongst the automotive community. This is largely owed to largely to the distinctive appearance of the car and the history which led to the car being made. While there is no other car like the one recently sold in Britain, other TestaRossas do exist across the globe and typically are sold for about 50% of the sum which this car was purchased for. This is a car that Bristol Street Motors would love to get behind the wheel of. To put the price of the TestaRossa in perspective, here is some information on the two cars closest to the final sale price of the car. Upon its 2013 sale, this beauty set the record for the largest sum ever paid in auction for a car. When you convert the currency, this car was sold for less than the Ferrari, meaning that the TestaRossa was also sold for more than any car has been sold in auction. 2011 saw a similar car sold in the USA. 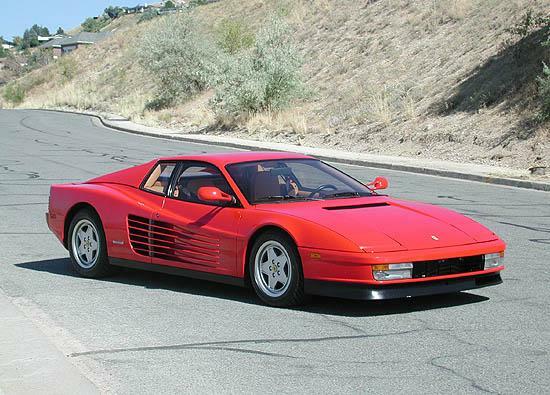 This TestaRossa is second only to the Mercedes-Benz for price paid for a car at auction at a whopping $16,390,000. However this still pales in comparison to the vast sum paid for the TestaRossa in the UK. One of the reasons why it did not sell for as much was due to the poor condition of the car, although its heritage still ensure it went for millions. Similarly, another of the cars was sold in 2009 for $12,402,500, but once again the near perfect state of the Ferrari sold in Britain is why it was so much more than the 2009 sale. Previous story Why Do People Make The Stupid Decision Of Buying Useless Status Symbols?